The B6 blood test checks the vitamin B6 level. What is a B6 blood test? The B6 blood test measures the level of B6 blood level. Why is a B6 blood test important? The vitamin B6 test helps check for a vitamin B6 deficiency. Is any preparation needed for a Vitamin B6 test? It is recommended that the patient avoid alcohol and vitamins for 24 hours before testing. This Vitamin B6 Test is a blood test. The vitamin B6 test, also known as a B6 blood test, B6 lab test and a pyridoxine test, measures the B6 blood level. Vitamin B6, also known as pyridoxine, is an important B vitamin. Sometimes referred to as PLP, B6 is involved with making hemoglobin and histamine in addition to having a number of roles in metabolic processes in the body. Vitamin B6 is also important in enabling the creation of the neurotransmitters dopamine, epinephrine, GABA, norepinephrine and serotonin. B6 can be naturally found in foods such as plants and grains and is sometimes fortified in other foods. A vitamin B6 deficiency can cause skin issues (dermatitis), characteristic tongue abnormalities, nervous system issues and anemia. 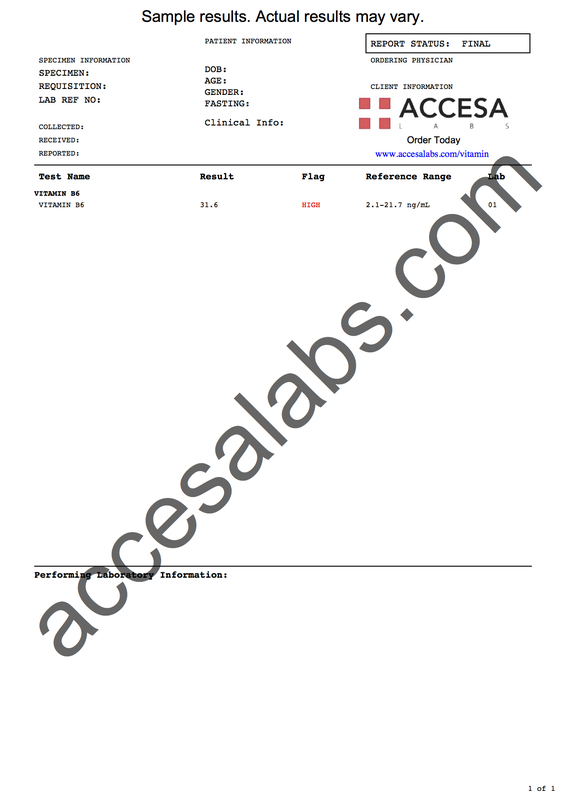 This particular B6 blood test uses an LC/MS/MS methodology to measure B6 (pyridoxal) blood levels. To get a vitamin B6 lab test near you, simply order online and get your blood drawn at your selected Quest Diagnostics lab. Once your vitamin B6 lab report is ready, you will be able to download them electronically. As is demonstrated on the B6 sample lab results above, the B6 blood levels are reported as a number and can be compared against the reference range provided by the lab to get a sense as to whether you have a B6 deficiency. Fasting for 8-12 hours (overnight) is recommended prior to undergoing this B6 test and it is useful for looking for B6 deficiencies or overdoses (excess levels). For a more detailed vitamin screening panel that includes the B6 blood test, check out the advanced vitamin panel or the comprehensive vitamin & mineral panel. Vitamin B6 Test at Guaranteed Prices.